Trials & Tribulations Of A Brummie Mummy: Chicago Town Pizza Review. Ok, nothing beats pizza! It's a massive favourite in our house. I've had the mini Chicago town pizzas but never the family sized ones. We picked up two pepperoni pizzas, and got the family to test them out. The pizzas had lots of flavours, the kids loved it and even the crusts got eaten up to. The crusts was pretty amazing. The pizza Tasted fresh and wasn't cardboardy like some frozen pizza's are. 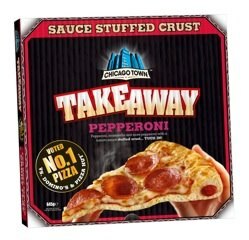 No wonder Chicago Town have been Voted the UK’s No.1 pizza, more popular than Domino’s and Pizza Hut when tested independently on description, price and taste. Chicago town have just brought out some new flavours and brought back The New Yorker. The UK’s number one New Yorker is back! 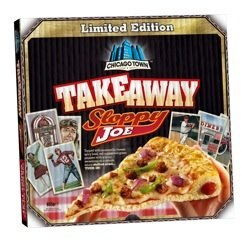 Once a limited edition, it proved so popular, it is now back in the Chicago Town Takeaway range and here to stay. Loaded with BBQ sauce, mozzarella, pepperoni, mushrooms, bacon and smoke flavoured ham and a saucy stuffed crust. The New Yorker features Chicago Town Takeaway’s unique soft rising dough – so it bakes and rises for the first time in your oven – perfect for sharing. And if the smell of freshly baked dough isn’t enough to get your tastebuds tingling, its BBQ sauce stuffed crusts sure will! Sloppy Joe is available for a limited time only is action-packed and is the perfect team mate - bringing your favourite authentic American flavours direct to your freezer. Loaded with mozzarella, spicy beef, red onions and green pepper with spicy seasoning and topped off with tasty tomato stuffed crust. The Sloppy Joe also features Chicago Town Takeaway’s famous unique soft rising dough so it bakes and rises for the first time in your oven – giving a fresh takeaway taste and making it perfect for sharing. To join in on all the action visit the Chicago Town Facebook page for all the latest news, promotions and New Yorker giveaways.